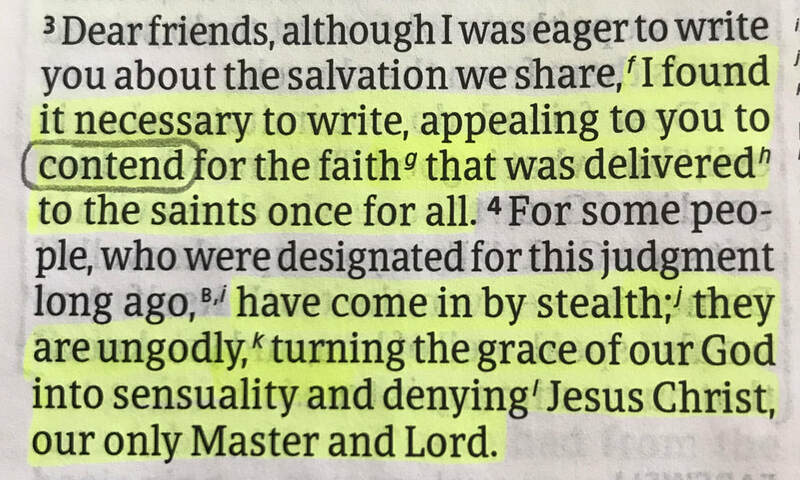 In Jude, verses 3 and 4, we are to "contend" for the faith. We are to stand up to false teachers and wolves in sheep's clothing. There is nothing "unloving" about standing for the truth of Christ and His Word. Sadly, we have to contend for the faith within the walls of the church because we have allowed the wolves in the door. Instead of kicking the wolf out we've been indoctrinated that it's "evil" to hurt someone's feelings. So the wolf has been allowed to multiply and so has it's heresies. Stand fast brothers and sisters, hold on to the Word of God! And do not be afraid to contend for the faith. "Did God really say?" Four words that changed the course of human history. 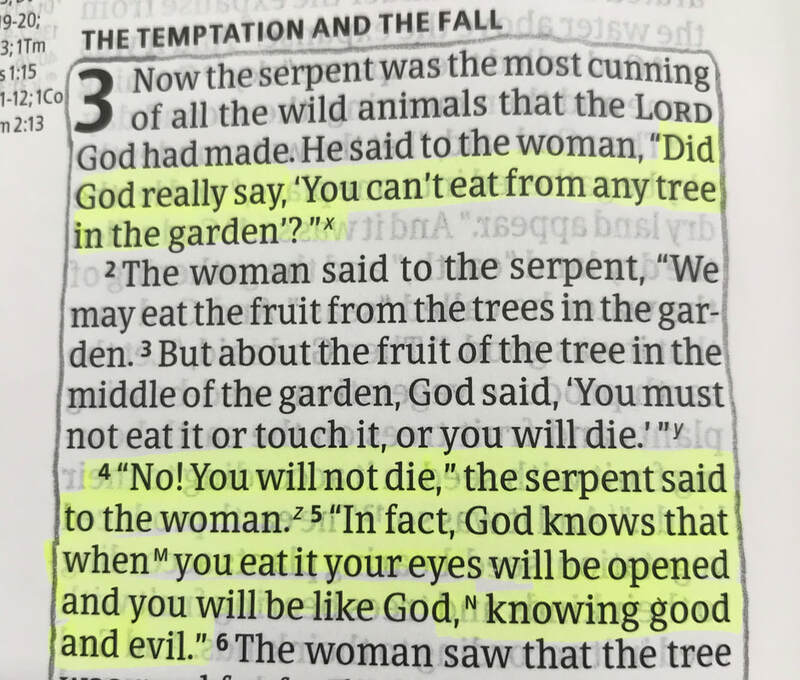 Yes, God really did say to not eat from the Tree of Knowledge of Good and Evil. Yet Satan, used this lie to deceive Eve and he still uses this lie today to deceive the world. He even uses this lie to deceive many Christians in the church when it comes to "social issues". He whispers in these Christians ears "Did God really say...." It's no wonder that the Church has lost her influence and place in the American culture. We have abandoned the truth of Sola Scriptura (Scripture Alone) and have compromised to the demands of godlessness. Four little words that still impact the world today. Paul was prophetic when through the power of The Holy Spirit he penned these words in Romans 1:18-32, this picture of Scripture covers Romans 1:28-32. The "end" result of what begins in verse 18. This is us, this is America 2019. 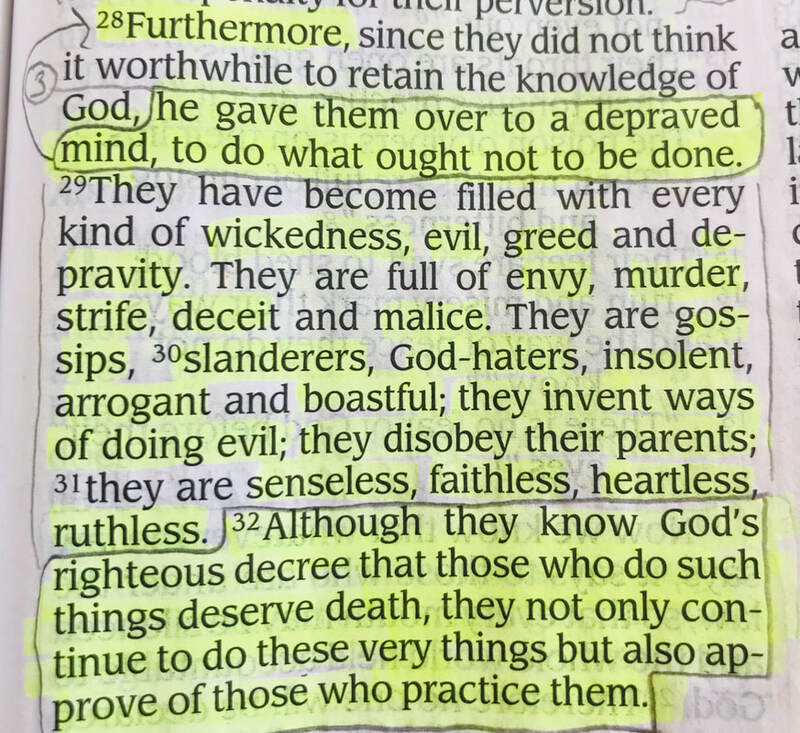 Notice the Bible says "God, he gave them over.." Think on that. 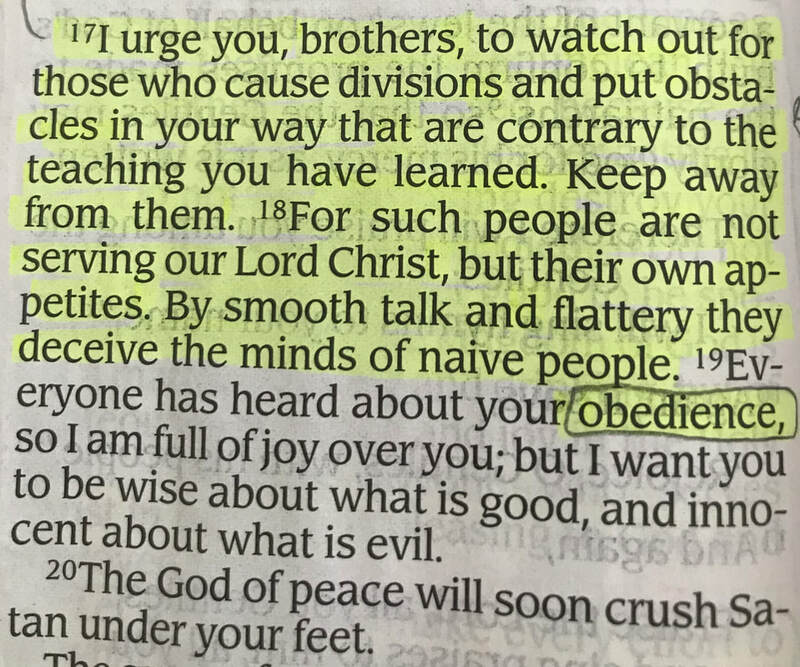 Romans 16:17-20 - Pay careful attention to people around you. A Bible verse that every believer in Christ should have memorized because it is needed! If we would swallow our pride, walk in forgiveness, and help build others up instead of tearing them down - life in the church would be much better. We Are Not All "Children of God"
"We should all be kind and respectful, we should just love everyone because after all, aren't we all God's children?" Now, if we are all "God's Children" shouldn't we all go to heaven? Yet, here, Christ proclaims that the majority of people will enter the wide gate that leads to destruction. How can this be if we are all Children of God? Simple: we are not. To say otherwise denies the truth of Scripture and makes Christ (God in the flesh) a liar. The appropriate theological term to use when dealing with people is this: "We are all God's creation." 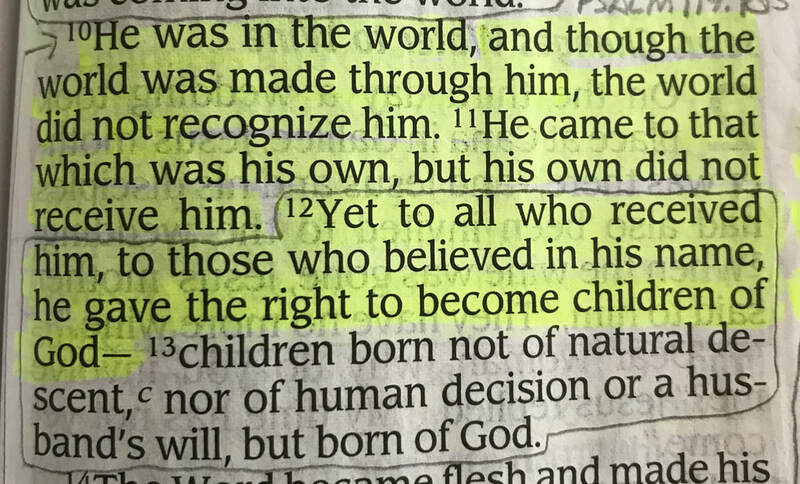 A Child of God is someone who believes on Christ and Christ alone for their salvation and He gives them the right to become a Child of God. The term "We are all God's Children" speaks to a form of Christian Universalism that God will save everyone in the end because of His love for us. That is heresy and is found nowhere in Scripture. So Christian, please stop using the term "We are all God's chldren" because we are not. To begin, let’s define sin as mentioned in the Bible. Hmmm. Law of God? We might immediately think of the Ten Commandments. But where did those come from? Answer: from God. But that raises the question, where did God get them? Since the Bible teaches there is nothing apart from God, and the Ten Commandments came from God, that would mean these laws are intrinsic (essential in nature) to God. In other words, they are God’s nature; His personality; who He is. Therefore, sin is anything contrary or opposing to God Himself. 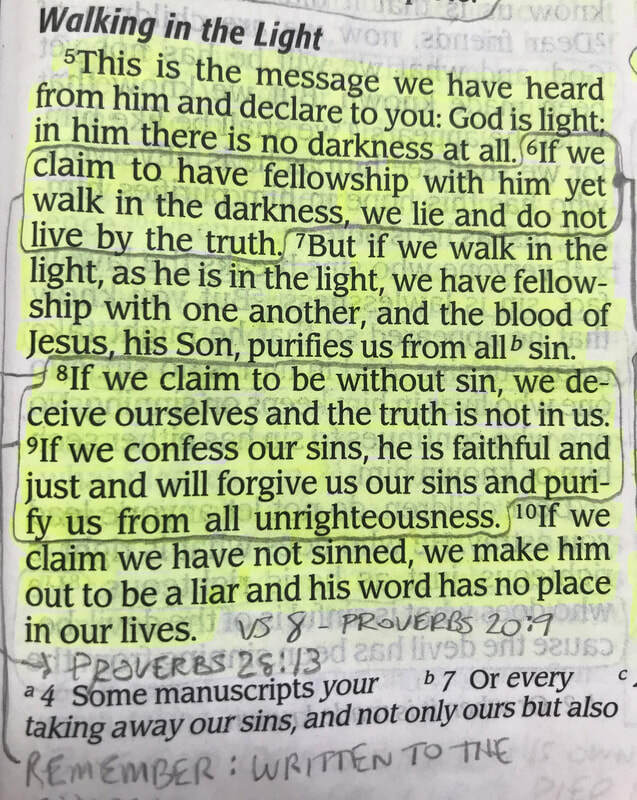 Meaning, sin is a disconnection and separation from the Lord. Now that sin is defined, we must examine ourselves. The Bible specifically states ALL have sinned. (Romans 3:23) That includes me, and you, and him, and her, and them, those people over there, and … every single human in the world. There is no exclusion: none. If each of us examines our thoughts, our actions, our motives, we easily find reasons to hide from God. Why? Because we’re guilty. Everyone experiences a disconnection from God. The thing is, you are I are very good at concealing our sin. Sin is deceptive. We’ve learned what to say or what not to say to achieve a measure of acknowledgement from other folks. As Christians, we fail to consider the Lord when we hide our motives. We ignore God in our rush to crave acceptance, to be recognized. Thus we’re guilty of disconnecting from God. There’s a price to pay for being silent to the screams of guilt. If we’re truthful, we fear allowing anyone a peek at our most private fantasies, our most hideous failures, or to observe our most vulnerable moments. We have an inner room in our lives, a top-secret closet with all our sordid stuff. It’s dirty, it’s filthy, yet we keep it hidden and refuse to acknowledge it. We even fail to share with God. There’s a reason we keep these thoughts secret, we fear judgment. Sadly, to judge other people is a common human sport. We panic that others will point fingers. We feel abandoned because of our choices and our thinking. Abandonment and isolation becomes sheer terror. We internally skulk and hide to keep secret our inner self. It’s too unacceptable and hideous to be revealed. In Romans, Paul gets right to the center of this problem. Everyone shares this disconnect from God. Every one of us are failures, are fearful, are filled with regret, and are helpless. We just don’t want to admit it. We are sinners disconnected from God. As humans, we deny it. As Christians, we ignore it. Maybe we might point to someone else when their sinful ‘self’ is exposed. However, we never disclose our own guilt. To do so would admit we are spiritually naked and scared. Our religiousness is other-directed and we never allow ourselves to be reflected in the mirror of another’s distress. We become an audience as if in the darkness of a theater. We watch someone else’s agony on the distant stage, and the remoteness makes us feel protected. We may empathize with the other person, but that’s not the same as being front-and-center. It’s much safer to be a detached observer. Safer—and yet unsatisfying. There’s a tendency in humans to catalogue moral failures. We often think of lying, cheating, lusting, murder, stealing, adultery, etc. Sins (plural) is much easier to handle because they are defined by an activity. But sin (singular) is much more encompassing, and we almost always see it in others, never ourselves. We’re told from scripture we have a sinful nature, but we never (if ever) see that deceptive beast. Maybe in our Christian lives we should shift our attitude toward thinking of ourselves as being disconnected from God. If we don’t admit the separation from God, we won’t correct it. If we fail to correct it, we continue to hide our disconnection. The problem feeds on itself. When we disconnect from the Lord, sin runs rampant; sin (singular). When we disconnect, our human activity becomes filled with concealment. We don’t want others to know of our disconnect status, and attempt to cover it up. Doing that is not very much about choices, but rather, hiding the fact we’re not in communication with God. The result? We’re left empty, we become stressed, and our motives turn secretive. Internally, we lack contentment. Our peace flies away. Within, we’re in turmoil. To remedy this, a change of attitude it required. It becomes necessary for us to work on why we act as we do, and why we believe as we do, and what to do about it. Maybe, but the alternative is to stay the same and is much worse in the end. To stay in fellowship with God is absolutely essential for a life without strain, stress, fear, or disconnect from the Lord. 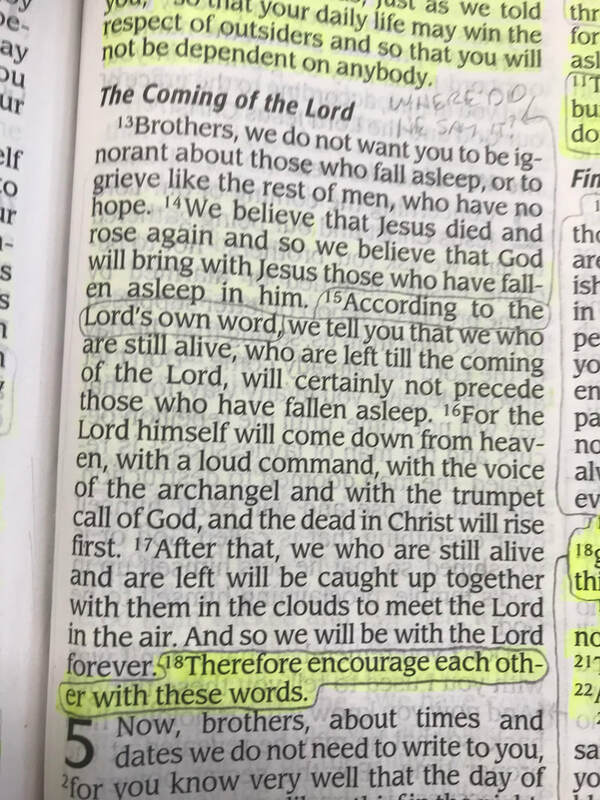 ​I'm reading/studying 1st Thessalonians this morning and Paul's words in chapter 4 struck me: "Therefore encourage each other with these words." He was referring to the return of Christ. The reason it struck is that I don't encourage others with our Saviors return as I should. That should give us immense joy to think on Christ's return, to give us peace in this sin-filled snot-bucket we wade through. Do we believe that Christ will indeed return? Do not let that promise ring hollow in your heart today. Instead, let it encourage you through whatever pain this life has given you. 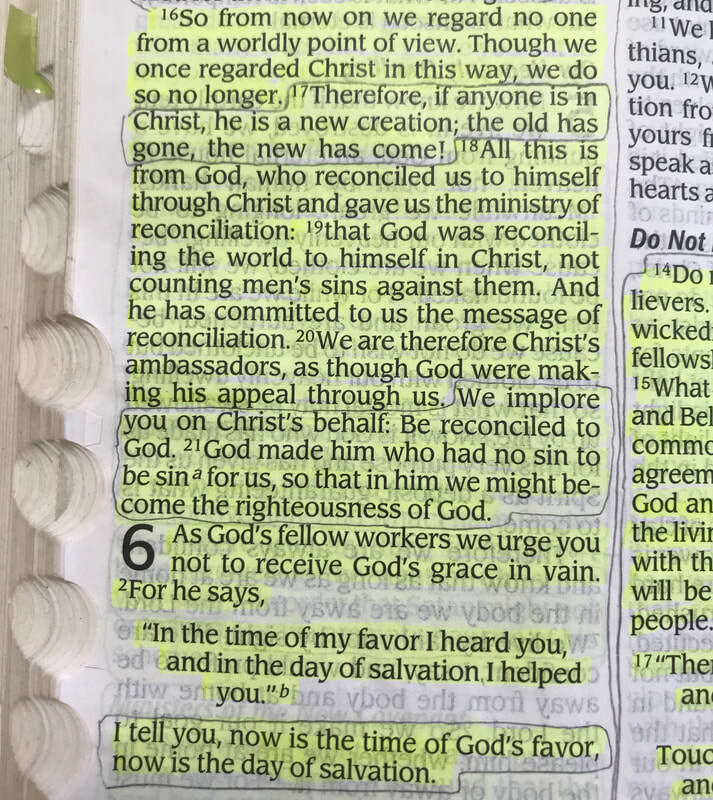 1 John 1:5-10 - Walking in the Light, do we desire that? I mean truly desire that as Christians. It is something to dwell on today.